The intelligence community needs to revamp its approach to analytics -- and that means creating an analytics strategy that will change the status quo. The challenges facing analysts are consistent throughout the strategic, operational and tactical levels of intelligence operations. The intelligence cycle (see diagram below) is a great teaching tool, but in practice cohesion throughout the process is extremely problematic. Often times the Priority Intelligence Requirements that come out of the Planning and Direction phase seem cookie cutter and are so high level that it’s difficult to measure impact. Intelligence Requirements and Essential Elements of Information allow for more specific information to be captured through the monitoring of Indicators and Warnings, but how well can we, and are we, tracking the progress of answering these requirements? How accurately can we assess if the Priority Intelligence Requirements (PIRs) being tracked at the tactical level have any impact at the operational or strategic levels and vice versa? We list our PIRs on a PowerPoint slide and brief leadership on where things stand without cognizance of how others are briefing the status of similar or related PIRs to their leadership. How does that PowerPoint slide actually show impact in a way that influences the intelligence cycle and real world operations? It doesn’t. It’s a slide with information that rarely finds purpose -- and that must change. A significant amount of money goes into the Collections phase and rightfully so. Organizations have used both Common Operating Pictures (COPs) and Common Intelligence Pictures (CIPs) to track collections assets, but where does the analytics behind the information collected feed into those COPs and CIPs? It generally doesn’t. I would argue that we have yet to execute a true CIP because we have failed to integrate the depth and breadth of analytics in a way that presents a comprehensive picture of our intelligence efforts. Collections and Processing and Exploitation are the phases I like to refer to as the science of intelligence. This is where the intelligence disciplines sit, and there’s a lot of technical expertise and procedures that go into understanding how to deploy assets and decipher the data collected. Both of these require expertise in one particular area – a silo, if you will. You wouldn’t have an analyst trained in geospatial intelligence serve as a signals intelligence analyst because each field requires training, expertise and understanding of the given intelligence discipline. The silos of information should be broken down in the next phase of Analysis and Production, but often times organizational and technological barriers exist that make intelligence fusion difficult. If the science of intelligence happens during Processing and Exploitation, then the art happens during Analysis and Production. This is where everything is supposed to come together to provide a higher level understanding. But how do we really analyze? We have long used IPB/IPOE (Intelligence Preparation of the Battlespace/Operational Environment) as a manual guideline to prepare briefings. 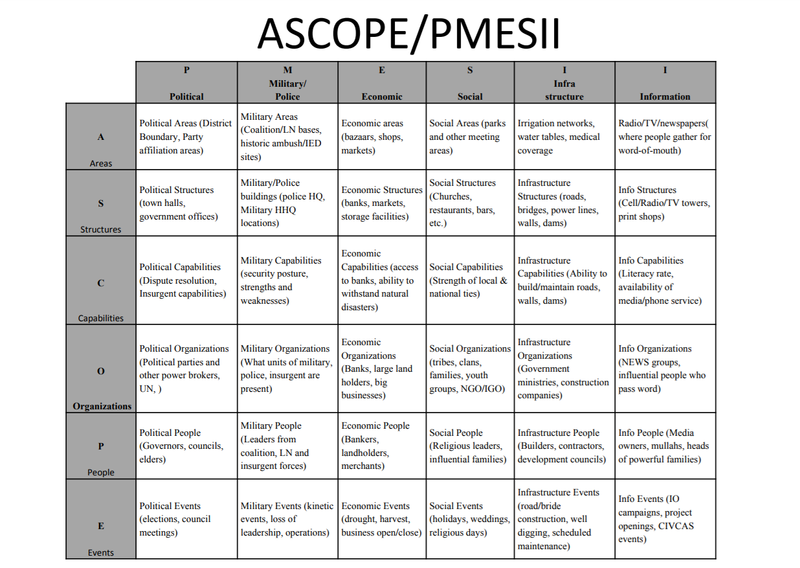 We incorporated the ASCOPE and PMESII frameworks (see chart below) to monitor topics that were key factors in monitoring activities within counterinsurgency environments. But we have yet to meaningfully progress beyond categorizing information to capturing a true strategy for analyzing and providing a deeper understanding of the battlespace. At the strategic levels you still have analysts talking about Analysis of Competing Hypotheses, Devil’s Advocate and Alternative Futures techniques presented by Richard Heuer in the 1980s. His 1999 publication of Psychology of Intelligence Analysis still sits on the desks of many headquarters-based analysts. While Heuer does much to educate analysts on inherent and cognitive biases, little has been done to account for the changes technology brings to the analytic front. The painful reality is that whatever technique or procedure you follow, you’re still manually producing intelligence, when you could be using advances in data science to propel intelligence analysis into the 21st century. The intelligence community has spent considerable amounts of money on tools without having a bigger strategy in mind. Geospatial intelligence and imagery analysts use ArcGIS. Targeting analysts may use Analyst’s Notebook or Palantir for network analysis or other organic, in-house tools. All-source analysts have any number of data mining tools at their disposal because someone has decided that if we can just search data and build PowerPoints then we can produce valuable intelligence. It’s 2017. There have been significant advances in analytics while we’ve been at war over the last 16 years. Rather than investing in analytics, the intelligence community (IC) has focused on procuring individual tools. The problem is those tools don’t seamlessly integrate with each other or into a logical analytic workflow. The IC has also focused on IT infrastructure such as DCGS to support these tools with the idea to provide one access point to the disparate set of tools. But where is the investment in analytics? The IC should be taking advantage of advances in machine learning, natural language processing, predictive analytics, artificial intelligence and even data management to truly support the analytics piece of intelligence analysis. Procuring individual tools to perform one specific task without thought of how those tools unite efforts among intelligence sections and even operations is not a successful strategy. We must train the basic analyst with more technical proficiency to use advanced analytics capabilities, while also honing the craft of revealing the story that resides within massive amounts of data to make intelligence consumable and actionable. 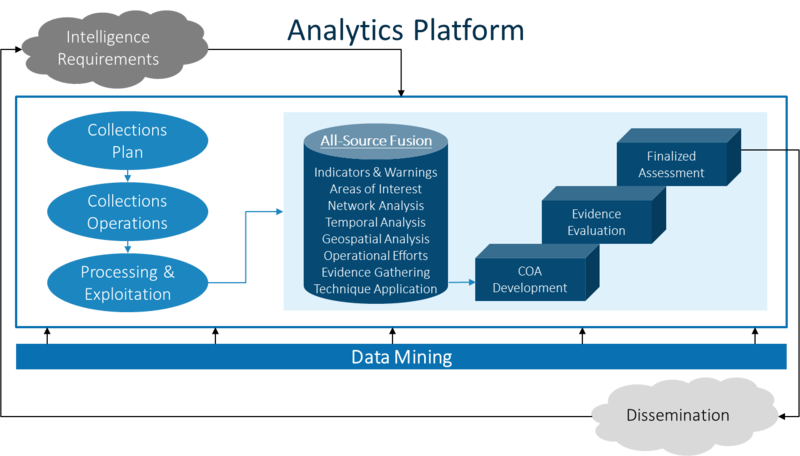 An analytics platform should be able to support all phases of the intelligence cycle. There is too much data and too many intricacies within the volume of data coming in to solely rely on human experience and instinct. We should by no means replace that experience or instinct, but we should be smarter about how we use technology to augment the job we’re expecting intelligence analysts to perform. Imagine being able to support the entirety of the intelligence cycle on a true analytics platform that supports the data science analytics lifecycle from data to discovery to deployment. A platform that syncs with the intelligence cycle to provide evidence-based courses of action, automatically detects indicators and warnings that may differ from what we currently monitor, measures progress of answering Priority Intelligence Requirements, and provides tangible impact of intelligence operations. The technology already exists within the SAS Platform. The challenge lies in creating and implementing a strategy that accounts for modernization in training, customization of applications, and adoption of a culture that embraces a better vision for the future of intelligence. Mary Beth Moore is an Artificial Intelligence and Language Analytics Strategist at SAS. 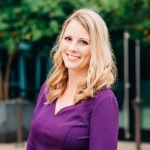 She is responsible for providing strategic marketing direction and leads global SAS messaging for artificial intelligence and text analytics. She frequently presents and writes on a wide range of technology topics, including AI, NLP and SAS’ Data for Good initiatives. Prior to SAS, Moore served in the United States Marine Corps and spent several years as an intelligence analyst and senior instructor in the US Department of Defense and Intelligence Community, primarily supporting expeditionary units and special operations. She is also a special education advocate, a disability rights consultant and a believer in community inclusion for people of all abilities. Interesting models and several valid insights- thanks for sharing. Readers might also be interested in the related 'Intelligence Engineering' work that I discuss in my recent book: A.D.M. Svendsen, Intelligence Engineering: Operating Beyond the Conventional (New York: Rowman & Littlefield / Security and Professional Intelligence Education - SPIES, 2017) - https://rowman.com/ISBN/9781442276642/Intelligence-Engineering-Operating-Beyond-the-Conventional ? 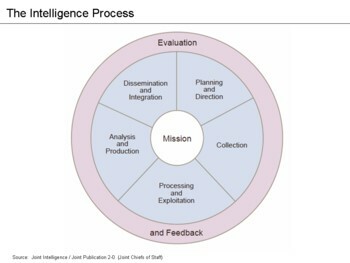 The (new) intelligence cycle should emphasize the use of pre-processing data using ML and AI.